Are you researching your family history all the way back to your Revolutionary War-era ancestors? Old newspapers are a great way to learn about your ancestry during America’s Colonial and Revolutionary periods. 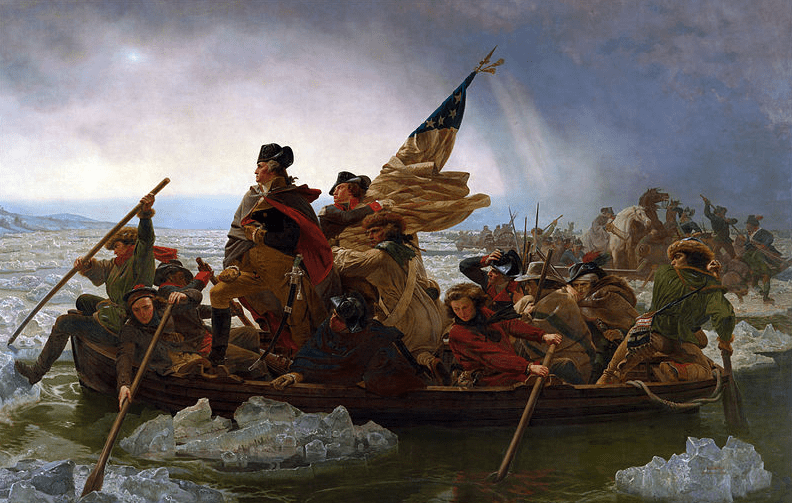 Painting: Washington Crossing the Delaware, by Emanuel Leutze (1851). Source: Wikimedia Commons. 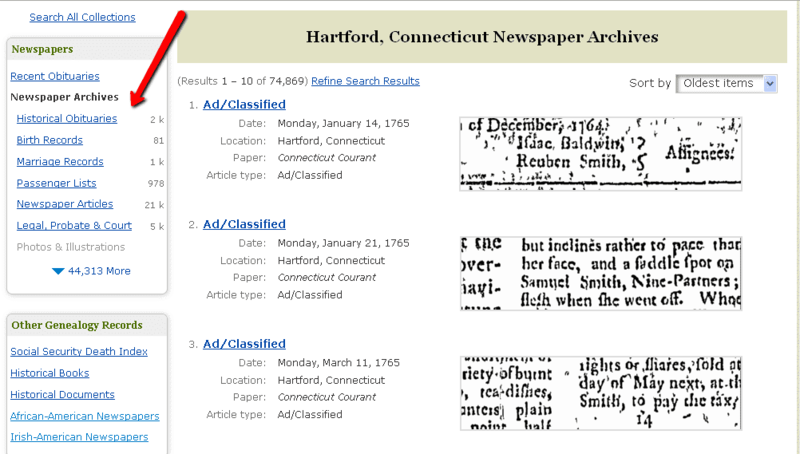 For example, GenealogyBank’s online Historical Newspaper Archives date from 1690 to today. What does this mean for you? It means a great opportunity to learn more about your Revolutionary War-era ancestors even when primary sources are few and far between. Remember that newspapers can hold rich family history information that details a person’s life story from cradle to grave. It’s natural to want to go straight to the advanced genealogy search engine on GenealogyBank to start your newspaper research. The advanced search engine is where we can limit or narrow our search, broadening it beyond just names by adding dates, and by including or excluding keywords. The advanced search box is a vital tool for researching a common surname. When researching a Revolutionary War-era ancestor, limiting the search to those years the ancestor was alive can help you filter out search results that aren’t about your specific ancestor. However, there is a caution: remember that the more information you add to a search engine the fewer results you will receive. Keep a log of your ancestor searches and results. Try a combination of keyword searches and note your results. One important aspect in researching Colonial newspapers is that language is much different now than in those early American newspapers. Don’t add too many “modern” words to your keyword search, as these may result in poor search results. Words associated with the cost of goods are just one example of a difference that could mean finding what you are looking for or not. It can be beneficial to take some time to read the newspaper from your ancestor’s area and time to get a sense of the layout, articles, and language. Not sure which Colonial and Revolutionary newspapers are available on GenealogyBank? 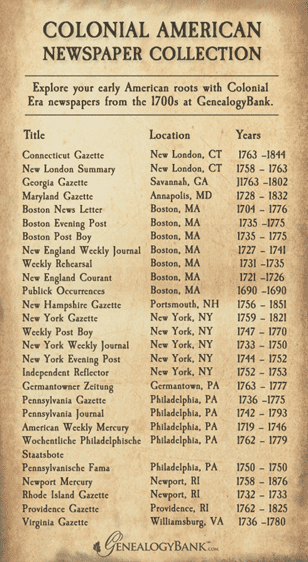 Find a list in this blog article: 27 Colonial Newspapers to Trace Your Early American Ancestry. Consider the possible articles that could exist about your 18th century ancestor in these early American Colonial newspapers! While you won’t know what specific articles your ancestor may have been mentioned in until you do an actual search, simply reading through some of these early American newspapers can help to get a sense of what news was reported during their lifetime. When researching a Revolutionary War soldier for example, look for anything that might provide some historical context (think pension laws and battle descriptions), but would not necessarily mention him by name. Of course, with a specific search you are looking for articles like a pension list or an obituary that would mention him by name. War is hell, and in every conflict some soldiers desert for a whole host of reasons. 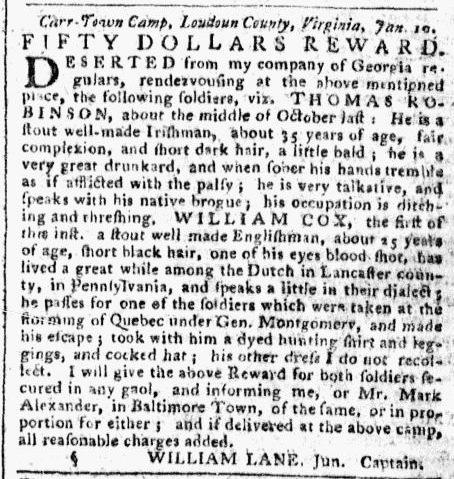 It makes sense that during the Revolutionary War desertions would be reported in the newspapers, so that the community could read the description and help find the missing soldier. 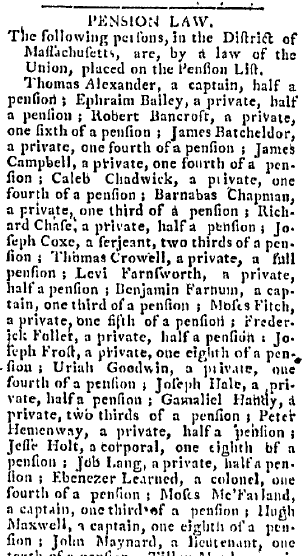 Did your ancestor receive a pension? 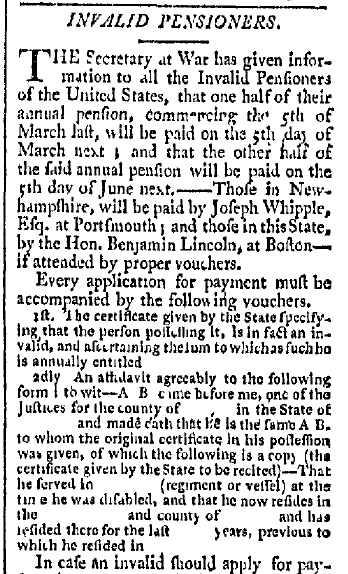 Newspapers may include lists of those receiving pensions, such as this one from a 1796 Massachusetts newspaper. Notice it includes the name and rank of the soldiers as well as the amount of each pension. The newspaper isn’t just a place to find your ancestors’ names; it’s also a great place to learn more about their personal lives and the times they lived in. In this example the invalid pension law is explained, as well as when the pension is paid and the application process. Found your ancestor’s military file or pension record? Great! Follow that up by looking for information in the newspaper. In the case of a common name, such as my ancestor Revolutionary War soldier Benjamin Jones, a search in the newspaper may bring up numerous hits but they may not be my Benjamin Jones. For that reason, consider using what you find in original documents in conjunction with the newspaper to help you narrow your search and analyze the evidence. What can you find in the newspaper about your Colonial and Revolutionary War ancestry? Plenty! Those genealogy records can be an important and colorful addition to your family history. What Do You Plan to Do with Your Old Family Heirlooms?